Q. What if casinos stop allowing bets after the ball is released? Will I have wasted my money? 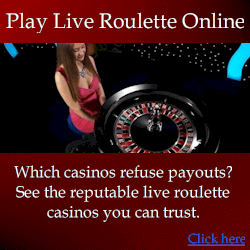 Even casinos that are aware of roulette computers very rarely disallow bets after ball release. This is because permitting bets after ball release speeds up the game, and takes advantage of compulsive gamblers who make last second bets. In a busy casino, the difference between allowing or disallowing bets after ball release is often over a million of dollars every day. Yes permitting bets after ball release exposes casinos to roulette computer teams, but the casino has a lot more to earn by permitting late bets than they have to potentially lose from roulette computer teams. This means that rather than simply cease allowing bets after the spin, casinos are far more likely to rely on detection of casino cheats, although the Hybrid is virtually impossible for casino staff to detect. Q. How can I manage multiple roulette computer teams if I only have one Hybrid computer? On Monday, “Team A” could profit $150,000 in one country. On Tuesday, “Team B” could profit $245,000 in another country. On Wednesday, “Team C could profit $275,000 in another country. The teams rest, then each move to different countries the next week. The process repeats. Normally if each team tried to win big in the same casino again too soon, they may be detected. The only real limit to winnings is what you get win without being detected. But in this case, the big wins were in different countries. To the casino, the wins look like luck. So you as the Hybrid owner can maximize winnings. Essentially having a Remote Hybrid is like sending multiple roulette computers to multiple teams throughout the world, then taking a share of profits. Q. Another roulette computer or system seller said your roulette computers are ineffective. What can you say about this? The Internet is full of dishonest sellers. You only need to visit us personally for a demo, or see a live demo via webcam. Then you will be left with no doubt the Hybrid is as we claim. Q. Why would you sell this technology? It’s not as if we are not getting a fair price for the sale of the technology. Additionally, there are just too many casinos where application is legal and practical, so we cannot possibly apply our technology in all casinos. Another consideration is I’ve been managing my private teams for many years now. At this point I’m comfortable with my financial position. What I need more of is time. Managing teams takes time, whereas selling the technology for a justified fee is easier and takes less of my time. You could say my motivation is more time than money. I also manage multiple businesses. Q. What if I find I cannot obtain constant clear line of sight in my casino? You don’t “need” constant line of sight – it is only the ideal situation. The hybrid can either be used with a hidden bodyworn camera, or via a remote camera hidden elsewhere. To obtain a prediction, the camera only needs to see the ball and green zero for about 2 seconds. Additionally, although it isn’t needed, the hybrid can utilize reflections from higher objects if line of sight is not normally possible. Q. Can I purchase a Hybrid without visiting you personally? Yes but then we’d require you to at least see it in an live webcam demo. This is so we are sure that you understand what you are purchasing. Q. What can I expect at a personal demonstration? You will see a full demonstration on a real wheel over as many spins as we can fit in a day, plus anything else you want to see. You are welcome to bring your own wheel. Q. Can you teach me How to Win at Roulette without electronic devices? The roulette strategy explained at www.roulettephysics.com does not require any form of electronics. You don’t need electronics to beat the casino, although cheating devices are quicker to use, and more effective.